All of you foodies who have requested "Grade B" syrup are in luck, as we just finished bottling this syrup in plastic quarts. We have a limited supply of the dark syrup and when it is sold out, we'll have to hope for more during the 2016 season. This syrup has a deep flavor and will be excellent in many of the recipes in the Maple cookbook (see prior post). 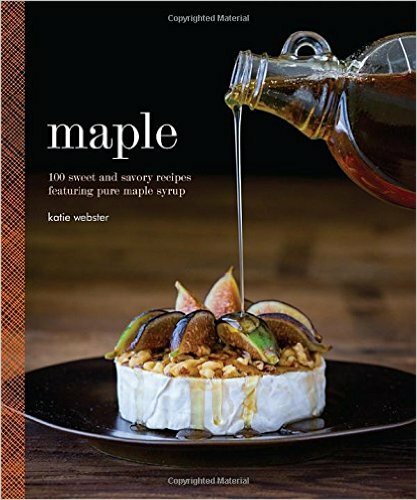 If you are looking for a gift idea, consider packaging the Maple cookbook and a quart of the Dark Robust Syrup - certain to be a hit with anyone who enjoys good food and cooking in the kitchen. If you are looking for some new ideas on how to use maple syrup, click here for the link to the book on Amazon. It is one of the best, if not the best, maple syrup cookbooks in our collection. Breakfasts, Drinks and Appetizers, Soups, Side Dishes, Salads, Main Courses and Desserts make up the contents of this terrific book. Links to resources, such as maple sugar, maple candy, unusual ingredients and baking equipment are found at the end of the cookbook. We've tried the Maple Pork Loin Roast with Apple Chutney, along with the suggested Sweet and Sour Sauerkraut and the Rustic Pear Galette. Delicious!! We've only begun to work our way through all the creative and appetizing recipes. We anticipate bottling Grade A: Dark Amber /Grade B maple syrup soon and we'll have this available on the website ASAP. Officially, according to the USDA, the dark maple syrup (Grade B) is now Grade A:Dark Color and Robust Flavor. The darker the syrup, the more intense the flavor - especially important in many recipes. Epicurious has a good article on the new syrup grading system: "Making Sense of the New Syrup Guidelines"